Copies of the President Trump's FY 2019 budget proposal are delivered to the U.S. House Budget Committee offices on Capitol Hill in Washington, Feb. 12, 2018. Trump’s budget for 2019 shows the administration’s concern about the threat from North Korea and its missile program. The budget calls for increasing the number of strategic missile interceptors from 44 to 64 and boosting other elements of missile defense. 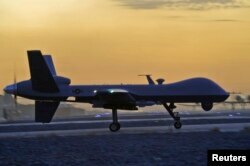 The additional 20 interceptors would be based at Fort Greely, Alaska. Critics question the reliability of the interceptors, arguing that years of testing has yet to prove them to be sufficiently effective against a sophisticated threat. The Pentagon also would invest more heavily in other missile defense systems, including the ship-based Aegis system and the Army's Patriot air and missile defense system, both of which are designed to defend against missiles of various ranges short of the intercontinental ballistic missile that is of greatest U.S. concern in the context of North Korea. Three of U.S. President Donald Trump's eight border wall prototypes are shown near completion along U.S.- Mexico border in San Diego, California, Oct. 23, 2017. The second stage of Trump's proposed border wall in Texas’ Rio Grande Valley would be 65 miles (104 kilometers) long, costing an average of $24.6 million a mile, according to the president's 2019 budget. That matches the amount requested in Trump's 2018 budget to build or replace 74 miles (118 kilometers) in San Diego and Rio Grande Valley, the busiest corridor for illegal crossings. 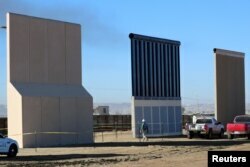 Walls currently cover about one-third of the border with Mexico, and the administration wants eventually to spend up to $18 billion to extend the wall to nearly half the border. Trump has insisted Mexico pay for it; Mexico says that’s a non-starter. The proposal sets aside $782 million to hire 2,000 U.S. Immigration and Customs Enforcement officers, whose responsibilities include making deportation arrests, and 750 more Border Patrol agents toward Trump’s long-term goal of 5,000. The proposal comes even as the administration has been unable to fill vacancies caused by attrition. The administration also wants to raise capacity at its immigration detention facilities to 52,000 people. It wants to collect $208 million in fees on “legitimate trade and travel” to pay for investigations into fraud and employers who hire people in the country illegally. The budget also calls for adding 450 Secret Service agents and support staff to reach 7,600 this year and inch toward a long-term goal of 9,500. It sets aside $6.9 billion for disaster relief. Trump’s budget proposes major changes to Medicare’s popular prescription benefit, creating winners and losers among the 42 million seniors with drug coverage. On the plus side for seniors, the budget requires the insurance plans that deliver the prescription benefit to share with beneficiaries a substantial portion of rebates they receive from drug makers. The budget also eliminates the 5 percent share of costs that an estimated 1 million beneficiaries with very high drug bills now must keep paying when they reach Medicare’s “catastrophic” coverage. Instead seniors would pay nothing once they reach Medicare’s catastrophic coverage level, currently $8,418 in total costs. But on the minus side, the budget calls for changing the way Medicare accounts for certain discounts that drug makers now provide to seniors with significant drug bills. That complex change would mean fewer seniors reach catastrophic coverage, and some will end up paying more than they do now. The budget also makes multiple cuts in different streams of Medicare payments going to hospitals and rehabilitation centers. Medicare spending totals more than $700 billion a year, and hospitals represent the single biggest category of costs. Overall, the budget calls for about $500 billion over 10 years in cuts from projected Medicare spending. FILE - Elementary students work on computers in Los Angeles, May 15, 2012. School choice advocates will find something to cheer in Trump’s budget. Fulfilling a campaign promise, he is proposing to put “more decision-making power in the hands of parents and families” in choosing schools for their children with a $1.5 billion investment for the coming year. The budget would expand both private and public school choice. Last year, the Trump administration also called for boosting charter and private school funding, but those initiatives didn’t win the approval of Congress. Among other key components is spending $200 million on STEM education and $43 million to implement school-based opioid abuse prevention strategies. Overall, the budget calls for a $7.1 billion, a 10.5 percent decrease from 2017. On the chopping block is $5.9 million in teacher preparation and aftercare programs. Last year, proposals for similar cuts were met with harsh criticism from teachers' unions and educators across the country. 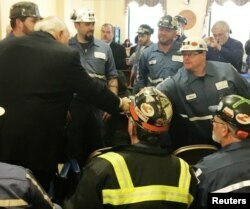 Robert Murray, founder and CEO of Murray Energy greets coal miners at the EPA hearing in Charleston, West Virginia, Nov. 28, 2017 before speaking to the panel supporting the repeal of the Clean Power Plan. The president’s budget would also make deep cuts to funding for cleaning up the nation’s most polluted sites, even as EPA Administrator Scott Pruitt has said that is one of his top priorities. Trump’s budget would allocate just $762 million for the Hazardous Substance Superfund Account, a reduction of more than 30 percent. After the president’s budget was developed, Congress reached a bipartisan agreement that would boost non-defense domestic spending for the next fiscal year. In response, Trump budget director Mick Mulvaney filed an addendum that seeks to restore about $724 million to EPA, including additional money for Superfund cleanups and drinking water infrastructure grants. Still, Trump’s budget calls for cutting programs that fight ocean pollution and raise public awareness about environmental issues and problems. The budget also would eliminate money for the popular Energy Star program, seeking instead to raise “a modest fee” from appliance and electronics manufacturers who seek to label their products as being energy efficient. Agency staffing would be cut by more than 20 percent from budgeted 2018 levels, from 15,400 full-time positions to 12,250. EPA's workforce has already shrunk dramatically in Trump's first year, as career employees left in droves while hiring has largely been frozen. There are currently 14,162 employees at the agency, the lowest staffing levels since the mid-1980s. Like Trump, Pruitt has expressed doubt about the consensus of climate scientists, including those at his own agency, that man-made carbon emissions are the primary driver of increasing average temperatures observed around the globe. The nation's top environmental official has instead advocated for the increased production and burning of fossil fuels. The Obama health law would be replaced with legislation modeled after an ill-fated GOP bill whose lead authors were Sens. Bill Cassidy of Louisiana and Lindsey Graham of South Carolina. The nonpartisan Congressional Budget Office said it would leave millions more uninsured. 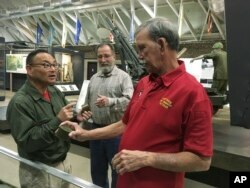 Vietnam veteran Dallas Brown, right, talks about food rations during the war with Tom Hara of the Fort Campbell Historical Foundation, at Fort Campbell, Kentucky, Oct. 27, 2017. The Veterans Choice health care program would get a big boost under Trump's 2019 budget. The budget proposes an overall increase of $8.7 billion for the Department of Veterans Affairs, primarily to strengthen medical care for more than 9 million enrolled veterans. A key component is a proposed $11.9 billion to revamp the Veterans Choice program, a Trump campaign priority. The planned expansion would give veterans wider freedom to receive government-paid care from private doctors and MinuteClinics outside the VA system. It has yet to be approved by Congress, however, in part due to disagreement over rising costs and concerns over privatizing VA. Under the increased budget caps approved by Congress last week, the Trump administration also tacked on an additional $2.4 billion for Choice and other expenses. Lawmakers' delay in reaching agreement has meant that a larger overhaul of VA Choice isn't likely to be fully implemented until 2019 or later. VA Secretary David Shulkin says Choice will help significantly reduce wait times at VA medical centers. The program was put in place after a 2014 wait-time scandal that was discovered at the Phoenix VA hospital and elsewhere throughout the country. Veterans waited weeks or months for appointments, while phony records covered up the lengthy waits. The program allows veterans to go to private doctors if they endure long waits for VA appointments, but it has suffered extended wait times of its own. Trump’s budget includes a modest increase of $191 million for what's known as “overseas contingency operations,” or active war zones like Iraq, Afghanistan and Syria. Secretary of State Rex Tillerson had argued in the past that the impending resolution of major global conflicts would decrease the need for U.S. spending and allow the Trump administration to significantly reduce what it spends overseas. Some of the most dramatic proposed cuts affect the State Department's Bureau of Educational and Cultural Affairs, which would see its budget cut by about $126 million, a reduction of nearly half of what it received in the past. 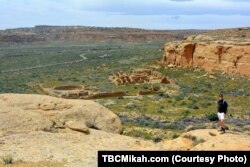 National parks traveler Mikah Meyer overlooks the ancient stone structures at Chaco Culture National Historical Park in northern New Mexico. The Interior Department’s proposed $11.7 billion budget includes $1.3 billion to address a growing backlog of projects to maintain and improve roads, bridges, park buildings and other infrastructure. The agency has an estimated $16 billion deferred maintenance backlog, including more than $11 billion for the National Park Service alone. Interior Secretary Ryan Zinke said the nation’s parks and wildlife refuges “are being loved to death” and need significant work to keep pace with an increased number of visitors. The National Mall in Washington, for instance, needs at least $800 million in maintenance, Zinke said. As part of the Trump administration’s infrastructure plan, officials have proposed an $18 billion public lands infrastructure fund to help pay for repairs and improvements in national parks, wildlife refuges and schools overseen by the Bureau of Indian Education, an Interior agency. The fund, which needs congressional approval, would be paid for in part through a projected 50 percent increase in energy leasing and development on federal lands, part of the administration’s strategy to achieve U.S. “energy dominance” in the global market. The budget also includes $17.5 million to begin to implement Zinke’s plan to reorganize the department and shift staffers at some agency headquarters, including the Fish and Wildlife Service and the Bureaus of Land Management and Reclamation, to the West. 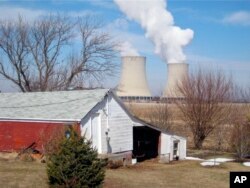 FILE - In this March 16, 2011 file photo, steam is released from Exelon Corp.'s nuclear plant in Byron, Illinois. The Trump administration is seeking $30.6 billion for the Energy Department, a figure that includes an additional $1.5 billion authorized under a two-year budget deal that Congress approved last week. Much of the additional funding, $1.2 billion, goes to the Office of Science to pay for basic scientific research. Energy Secretary Rick Perry said in a statement that the budget request supports the agency’s push to enhance energy security and modernize the nuclear weapons stockpile while boosting funding for cybersecurity and emphasizing the role of the 17 national laboratories that do cutting-edge research on everything from clean energy technologies to supercomputing to nuclear science. The budget again proposes steep cuts to energy efficiency and renewable-energy programs and calls for eliminating DOE's loan program and the Advanced Research Projects Agency-Energy, DOE’s innovation arm. Members of Congress from both parties support all the programs and are likely to restore much of the funding, although the loan program could face cuts. The Senate approved record funding levels for ARPA-E for the current budget year despite Trump's plan to dismantle it. Trump’s budget again proposes $120 million to revive a long-stalled nuclear waste dump at Nevada’s Yucca Mountain. The state’s Republican governor and lawmakers from both parties oppose the plan. The budget proposes deep cuts to funding for rental assistance programs, eliminates community block grants and references future legislation that will implement work requirements for some tenants receiving public assistance. Trump’s proposal reduces the budget for rental assistance programs by more than 11 percent compared with 2017. It also eliminates funding for the Public Housing Capital Fund, dedicated to supporting public housing complexes, and Community Development Block Grants, which are doled out to cities, counties and communities for development projects. The budget also requests legislation that would require able-bodied tenants who are receiving federal housing assistance to work. In a two-year agreement passed last week and signed by the president, Congress included an additional $2 billion earmarked for HUD. That addendum adds $1 billion to “avoid rent increases on elderly and disabled families receiving rental increases.” It also adds another $700 million toward housing vouchers for low-income individuals and families, and $300 million to aide public housing authorities. “President Trump is making clear, in no uncertain terms, his willingness to increase evictions and homelessness for the families who could lose their rental assistance through severe funding cuts, and for the low-income and vulnerable seniors, people with disabilities and families with kids who will be unable to manage having to spend more of their very limited income to cover rent hikes,” National Low Income Housing Coalition president and CEO Diane Yentel said in a statement. Trump’s 2019 Justice Department budget reiterates the administration’s priorities: fighting the opioid epidemic, fighting violent crime and drug trafficking gangs while providing tough immigration enforcement. It seeks more than $109 million for crime-fighting efforts, including $70 million for a partnership with state and local authorities called Project Safe Neighborhoods that targets gun offenders. It would also move the tobacco and alcohol-related responsibilities of the Bureau of Alcohol, Tobacco, Firearms and Explosives into the Treasury Department, which officials say would eliminate duplicative duties and allow the agency to focus more closely on fighting street crime. There's also a request for $13.2 million and 25 new positions to help “modernize” and speed up the ATF’s ability to register restricted weapons, such as machine guns and suppressors, after a steady increase in applications. The budget also seeks $295 million directed toward the opioid epidemic. That includes a proposed $31.2 million for eight new “heroin enforcement groups” to be sent to hard-hit Drug Enforcement Administration offices. Additional agents would target Mexican drug gangs. Special counsel Robert Mueller's team investigating possible Trump campaign ties to Russia is funded separately and not affected by budget requests to Congress. A lunch meal is served in a New York City soup kitchen (file photo). Trump’s budget proposes massive cuts to the program that provides more than 42 million Americans with food stamps. The budget also floats the idea of new legislation that would require able-bodied adults to work or participate in a work program in order to receive benefits under the Supplemental Nutrition Assistance Program. The president's budget would reduce the SNAP program by roughly $213 billion over the next ten years. Stacy Dean, vice president for food assistance policy at the Center on Budget and Policy Priorities, said the proposed cuts to SNAP account for nearly 30 percent of the program. “It would reduce benefits and undercut the program’s efficiency and effectiveness,” she said. NASA astronauts Mark Vande Hei, left, and Scott Tingle work outside the International Space Station on Jan. 23, 2018, to give the robot arm a new hand. The Trump administration wants NASA out of the International Space Station by 2025 and to have private businesses running the place instead. Under Trump’s 2019 proposed budget, U.S. government funding for the space station would end by 2025. The government would set aside $150 million to encourage commercial development. Many space experts are expressing concern. Sen. Bill Nelson, a Florida Democrat who rocketed into orbit in 1986, said “turning off the lights and walking away from our sole outpost in space” makes no sense. Retired NASA historian and Smithsonian curator Roger Launius notes that any such move will affect all the other countries involved in the space station; Russia is a major player, as are Europe, Japan and Canada. “I suspect this will be a major aspect of any decisions about ISS’s future,” Launius wrote in an email. NASA has spent close to $100 billion on the orbiting outpost since the 1990s. The first piece was launched in 1998, and the complex was essentially completed with the retirement of NASA's space shuttles in 2011. Private businesses already have a hand in the project. The end of the shuttle program prompted NASA to turn over supply runs to the commercial sector. SpaceX and Orbital ATK have been making deliveries since 2012, and Sierra Nevada Corp. will begin making shipments with its crewless mini shuttles in a few years. 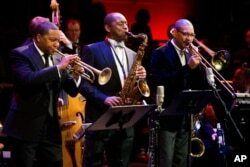 FILE - Musicians Wynton Marsalis, left, Branford Marsalis, center, and Delfeayo Marsalis perform at the National Endowment for the Arts Jazz Master Awards Ceremony and Concert held in New York, Jan. 11, 2011. Trump’s budget calls for the elimination of the National Endowment for the Arts and National Endowment for the Humanities, two prominent grant programs founded in the 1960s that Trump proposed ending in last year’s budget. Under his proposal, the NEA and NEH would “begin” shutting down in 2019. Neither organization should be considered “core Federal responsibilities.” Each program currently receives just under $150 million. Although some conservatives have long complained about the NEA and NEH, the programs have bipartisan support and funding for them was restored by Congress in 2017. Trump is also seeking to shut down other arts and scholarly programs that Congress has backed, including the Corporation for Public Broadcasting and the Institute of Museum and Library Services.